Chevrolet greeted the new year with a new advertising slogan. 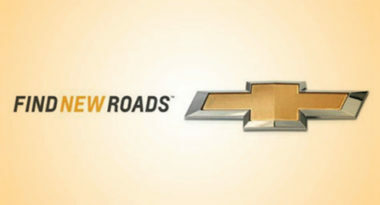 The American auto brand has shifted gears from its former “Chevy Runs Deep” tagline into the new “Find New Roads” message that will launch early this year. DetroitNews.com reported on how the automaker plans to roll out its new slogan and global ad campaign. “ ‘Find New Roads’ embraces the spirit of ingenuity that has been in Chevrolet’s DNA since the beginning and it will continue to guide every aspect of our business moving forward,” said Mary Barra, senior vice president of global product development. While Chevrolet has sold vehicles worldwide for nearly 100 years, this new advertising campaign marks the first time that the brand will align all of its marketing under one vision, making this Chevrolet’s first official global ad campaign. Interestingly, the new slogan subtly alludes to the brand’s new global direction. The brand’s prior slogan had been used since 2010. Its ad campaign had featured nostalgic images of Americana at a time when the company was trying to recover from the harsh economy by reclaiming its glory as America’s automaker. Perhaps one of the biggest signs that Chevrolet is taking a different road is the brand’s decision not to run a Super Bowl ad this year. While the automaker has advertised in the major sporting event for decades, the sky-high cost has driven the brand to pull out of the broadcast and “find new roads” for its advertising dollars. To learn more about the power of a creative advertising slogan, contact MDG Advertising. MDG Advertising, a full-service advertising agency with offices in Boca Raton and New York, NY, is one of Florida’s top integrated marketing agencies. Our 360° approach uses just the right mix of traditional and digital marketing to reach your advertising goals. While some industries may fare better in print or TV, and others online, we strive to create a balanced approach, where traditional and digital marketing efforts support each other and your message is tailored to the medium. To learn more about the latest trends in marketing and advertising, contact MDG Advertising.